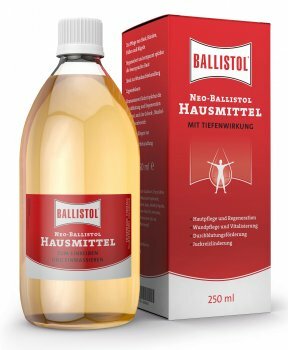 100 ml insect repellent as pump spray from Ballistol act as gnat spray, mosquitoes spray, tick spray etc. The tropicalized insect spray is suited for men, dogs, horses, cats and all other pets. The insect repellent offers sun protection through a UV filter, skin care and protection against cooling e.g. while sport. The 100 ml pump spray is always refillable and ideal for the way. With the tropicalized insect repellent Sichfrei (sting free) from Ballistol you are protected from gnats, ticks, mosquitoes etc. Ballistol sting free insect spray keeps all irksome insects away from your body. Stichfrei contains also an UV-filter for sun protection (sun protection factor: 6) and cares the skin. Furthermore, the insect repellent has a pleasant odor. Sting free is effectively as tick agent also for your dog, your cat, your horse and each other pet. Ballistol sting free protects you and your pets also from irksome and sometimes also dangerous bites of ticks. Use insect repellents safely. Before use always read the label and product information. Stichfrei is also a component of the 54-part Home Pharmacy and also of the Travel Pharmacy Kit. Stichfrei is also available for Kids and sensitive skin: Stichfrei Kids 30 ml or 125 ml. At the Ballistol Shop you get also mosquito nets for single beds and double beds as well as flyscreens for windows and also in bundles with Stichfrei for affordable total prices. Stichfrei tropicalized insect spray protects for up to eight hours against irksome insect bites such as from gnats, stinging flies, gadflies, mosquitoes, sand flies, tropical mopane flies and tsetse flies. Just spray it on your skin and forget about gnats and gadflies. Stichfrei has been tested for its toxicological harmlessness and is successfully used on all continents: Be it in the tropical jungles of Brazil, the gnat-ridden forests of Finland, the subtropical rain forests of the Himalayas, Africa or the subtropical zone of Australia, Stichfrei convinced its users in any part of our world. Stichfrei can also be used as sun protection. In combination with its anti-insect quality it is absolutely ideal for anglers, hikers, bathers and sunbathers. Here you find informationabout the mode of operation of the mosquito protection spray. Stichfrei Insect Repellent 10 Tissues in a box. 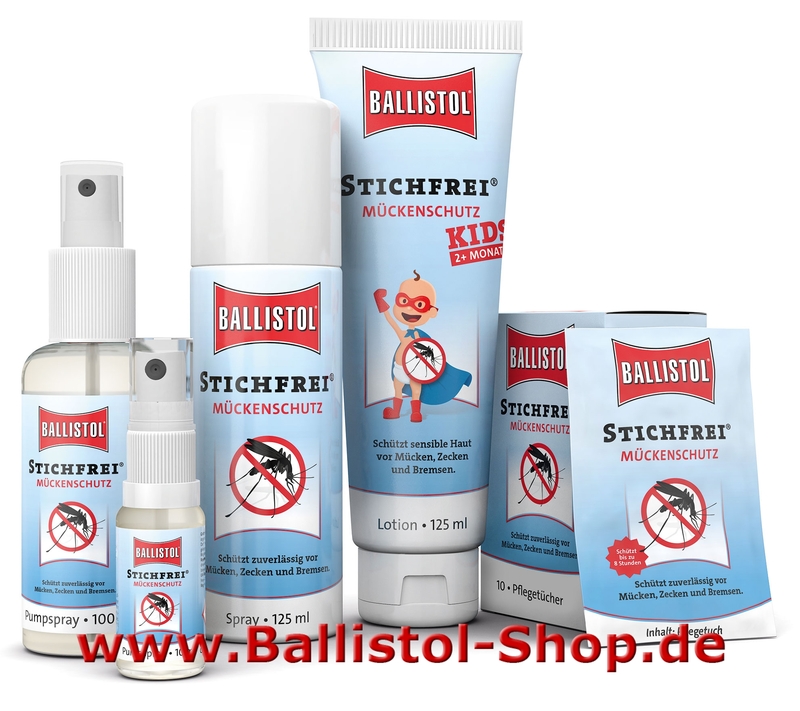 Stichfrei Insect Repellent Ballistol Atomizer 10 ml. Stichfrei Insect Repellent Ballistol Atomizer 100 ml. Stichfrei Insect Repellent Ballistol 125 ml Spray. 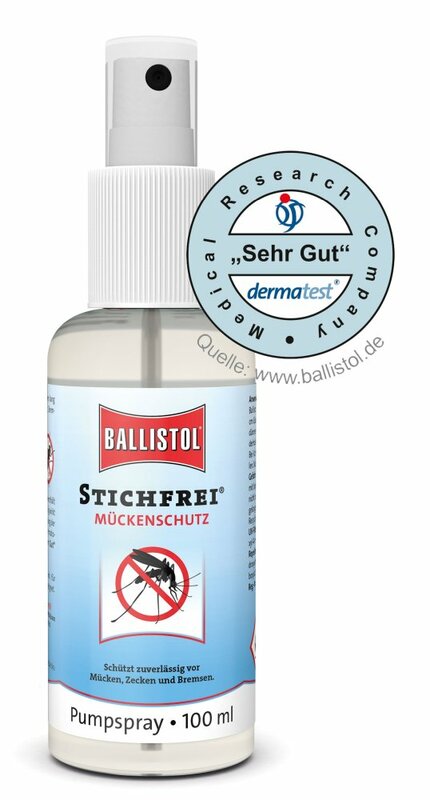 Stichfrei Insect Repellent Ballistol 500 ml Spray. Stichfrei Insect Repellent Ballistol 50 ml fluid. Stichfrei Insect Repellent Ballistol 500 ml fluid. 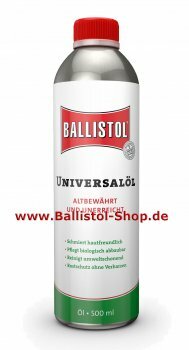 Stichfrei Insect Repellent Ballistol 5 liter canister. 50 ml fluid + 10 ml Stichfrei insect spray as pump spray to refill. 500 ml fluid + 100 ml Stichfrei insect spray as pump spray to refill. 500 ml fluid + 10 ml Stichfrei insect spray as pump spray to refill. 500 ml fluid + 100 ml + 10 ml Stichfrei insect spray as pump spray to refill. 500 ml hoard tin Stichfrei insect repellent + Atomizer. 5 liter Stichfrei insect repellent in a canister + Atomizer. Mosquito net for single beds + 500 ml insect repellent fluid + 100 ml insect spray as pump spray to refill. Mosquito net for double beds + 500 ml insect repellent fluid + 100 ml insect spray as pump spray to refill. 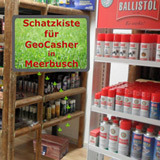 Counter Display Stichfrei Insect Repellent with 27 tins. Counter display of tissues for the way, 20 boxes each 10 tissues Stichfrei insect repellent. The bundles with atomizer or pump spray are environmentally friendly alternatives for aerosol sprays with propellant gas. Hand atomizer to atomize Ballistol Stichfrei and our other oils with specially pump mechanic. All atomizers, hand sprayer, oil pens and dispensers you will find here. Here you will find body care products from massage oils to the proven Neo Ballistol Home Remedy or Care Oil and nail oil. You have pets – At the Ballistol Shop you will find proven maintenance products for animal care. The animal care oil Ballistol Animal is an universally and efficacious care oil for all pets and animals. Get to know Ballistol Universal Oil – proven since 1904 and order without additional shipping costs. Here you will find all Sets, Bundles and Kits. Here you will find a great number of our products in bundles – e.g. with environmentally dispensers, oilers and atomizers as alternatives to spray cans with propellant gas and of course for affordable total prices. Also you find here all counter displays from the Ballistol Shop. Here you will find all Oilers and Dispensers. Here we offer environmentally friendly alternatives to spray cans with propellant gas and also precision oil pens to dose your oil drop by drop. If you don’t like to buy online, order by phone, personally, by fax or e-mail. P241 Explosionsgeschützte elektrische Betriebsmittel/Lüftungsanlagen/Beleuchtung/. verwenden. Here you add a review for the product Insect Repellent Ballistol Stichfrei Atomizer 100 ml Mosquito Repellent and share your experience with other customers.